The Cortes-La Muela complex located in Júcar River (Spain) has a total installed capacity of 1767 MW. It includes the largest pumped hydroelectric storage plant in Continental Europe. La Muela I and La Muela II power plants feature 7 X 212 MW reversible turbines. 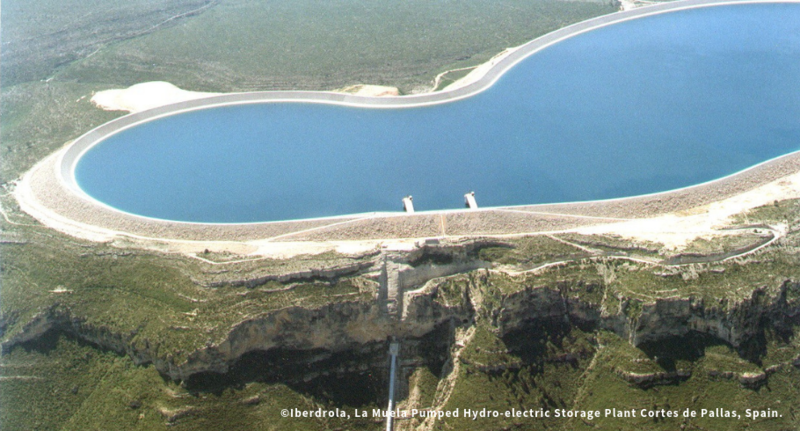 Two reservoirs with up to 524 metres altitude difference allow water to be stored in the upper reservoir and used to produce electricity during peak consumption times. Pumped hydroelectric storage is the most cost-effective large scale storage method. It provides stability and flexibility to the electrical system, as it can produce large amounts of power with fast response times without any GHG emission.